The families that stay with us cite the evening meal as one of the most helpful benefits of staying at the Ronald McDonald House. The opportunity to be close as a family and participate in a normal family ritual while in the midst of a not normal situation is comforting and relaxing. Meal Volunteers provide an evening meal 365 days each year for our families. They prepare for 30 - 35 people and may prepare the meal at the Ronald McDonald House or prepare the meal off-site and bring it to the house. Dinner is served at 6:30 pm by our evening volunteers, so the guest chefs may stay or leave as their schedule permits. 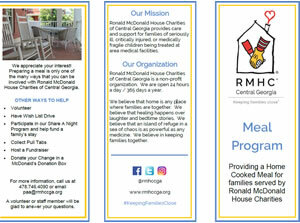 For more information, download our Meal Brochure (PDF) or contact Marqueta Lucas paa@rmhccga.org or 478-746-4090.